So you’ve finally managed to save up enough money to buy yourself a new car, great! There’s just one problem though. What on earth are you going to do with the old one?? Many people will be in a position to sell their car on privately to recoup some of the cash they’ve spent on their new motor. But what if your old car is so ancient or tired that it isn’t even worthy of a sale? What do you do then? In cases like these, it may be that your only option is to send it to the scrap heap. You will usually still get some cash in your pocket when you scrap your car but ‘How does the process of car scrapping work?’ you might ask, and is scrapping your old vehicle an environmentally friendly option? To help answer some of your questions regarding these legitimate concerns, we have decided to share the following infographic with you today which we found on the Sell The Car website – I hope they don’t mind me borrowing it 🙂 – which gives you a little more information about what happens to a car after it has been sent to the scrap heap and also how reputable scrap car companies deal with the remains of your vehicle in an environmentally friendly way. So there we have it, now you know just what happens to your vehicle once it has been picked up by the scrapping company and taken away to the scrap yard. 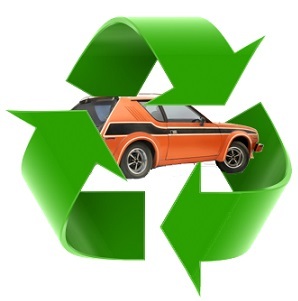 So if you feel that your old vehicle truly has seen its final days – making a private sale through a website or local newspaper an unrealistic prospect – at least you know that you have another option for the easy and environmentally sound disposal of your vehicle. An option which should also put a little bit of cash into your pocket too! Have you ever scrapped a vehicle in the past? Did you get a good price for it? 2 Responses to Is it Environmentally Friendly to Scrap a Car? I had a really beaten up car that I was considering scraping, but ended up trading it in when I bought my new car because I got more money for it that way. Me too. I’d rather trade a car than scrap it.